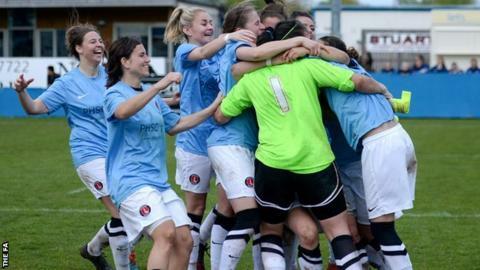 Charlton Athletic have won the Women's Premier League Cup for the third time in their history, beating Sheffield FC 4-2 on penalties in Sunday's final. After a goalless 90 minutes, the score remained 0-0 after extra-time, before Addicks striker Sam Pittuck eventually struck the decisive penalty. Before that, Charlton goalkeeper Megan Lynch saved two kicks in the shootout, before seeing her own effort saved. The win sees Charlton add to their previous successes in 2004 and 2006. With three wins, Charlton are now the second most successful side in the history of the Women's Premier League Cup. Arsenal ladies are the record 10-times winners of the trophy but, as a Women's Super League side, no longer take part in the competition. Charlton, who currently lie third in the Women's Premier League Southern Division, also reached the quarter-finals of this year's FA Women's Cup, before losing on penalties to second-tier side Everton. Sheffield still have hopes of winning promotion to the Women's Super League this summer, as they currently lie second in the WPL Northern division, with one game in hand on leaders Coventry. Only one team can go up from the WPL this season, with the winners of the Northern and Southern Divisions meeting in an end-of-season play-off on Sunday, 24 May. Sheffield FC: Wallhead, Murphy, Cox, Ashton, Goodman, Lee, Parkin, Ward (c), Johnson, Giampalma, McCiver. Substitutes: Michalska, Gilliatt, Fuller, Beanland, Horsley. Charlton: Lynch, Flack, Dixson, Paye, Coombs, Clifford, Pittuck, Shepherd, Whinnett, Graham, Harrison. Substitutes: Simmons, Newman, Hardaker, Howlett, Southgate.